Choosing your wedding cake can be simplified when you keep things in perspective. 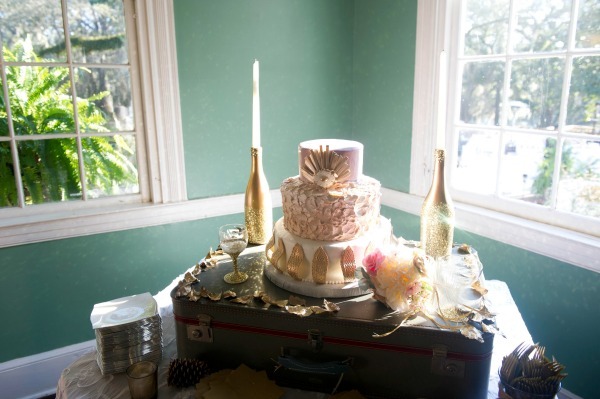 The wedding cake is NOT the most important part of the wedding or reception. Lots of guests at the wedding will not even see it or eat any of it. I know that lots of movies, portraying a couple planning their wedding, have scenes with the couple tasting cake, followed by a reception with this magnificent, elaborate, creation that costs a fortune. This is all fine and dandy if your dream wedding includes this extraordinary cake, but for the sake of planning your wedding for less, let's discuss some money saving ideas. You have to first stay within your budget. Now if your budget allows for an elaborate display and this is where you really want to spend your money, then by all means "have your cake and eat it too". However, if your budget would call for a much less expensive creation, you may want to have a very simple cake. Many brides know friends or relatives that can put together a very nice, tasty cake for much less than the bakery. In some towns there is the bakery of a supermarket, or other store, that will make a cake that tastes fresh, howbeit not extraordinary for much less. 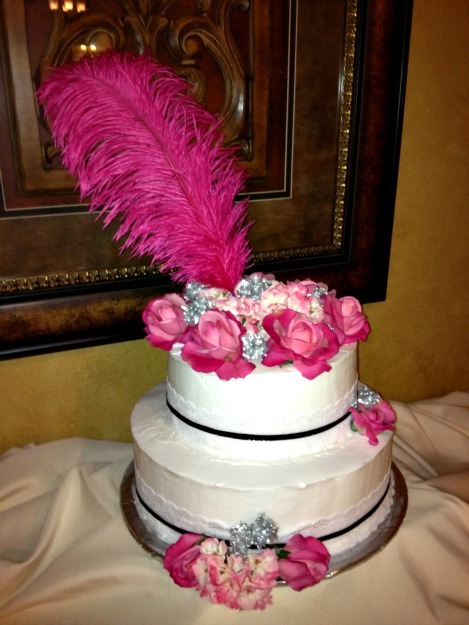 The 1920's cake below was done by simply using a a creme frosting, adding some lace and ribbon, then finishing it with some silk roses (the ones that really look real) and one fancy feather. Not very expensive at all. One way to save, in almost any bakery, is to order the cake without mentioning the word wedding. The words wedding cake will sometimes make the price jump by a significant amount. 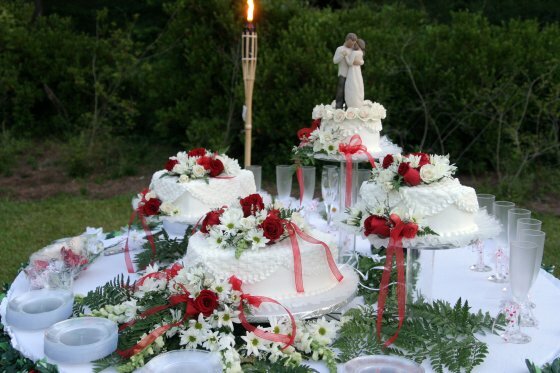 You can simply have three single cakes placed on three separate pedestals of varying heights (borrowed if you don't own them), with flowers and tulle draped around the bases of the pedestals and "voila" you have a very nice display for much less. How about this one? It's from our local Costco! Pretty simple but just right for this Bride's backyard wedding.....Simply beautiful. The rhinestone LOVE topper is from Amazon. There is also a wooden one that's lovely. 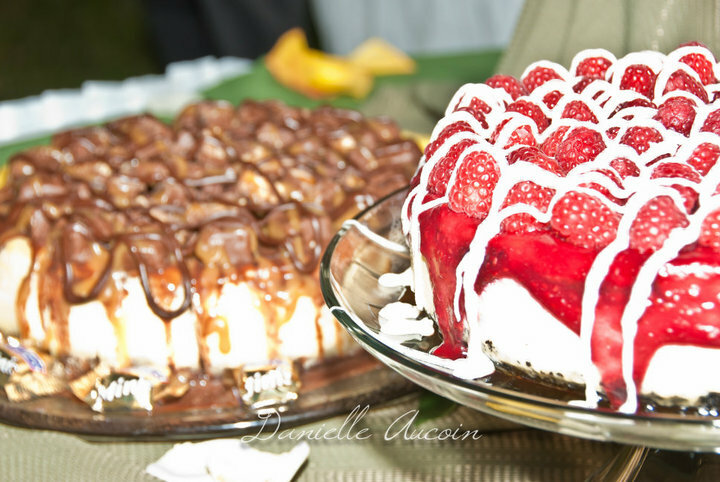 For those who choose not to have a large cake, you may decide to set up a table with several smaller, different flavor cakes as shown below. The groom's cake can be very simple. It usually has a theme to it of the groom's favorite hobby or pass-time. Sometimes it's even set to a career choice or the general theme of the wedding. You can definitely have a simple cake made by a friend or family member. Make a sheet cake from any of your favorite cake mixes then decorate it with store bought frosting. Or, buy a sheet cake at your favorite supermarket bakery. Using this option will allow you to ask for them to add some decorating with frosting like the grass and edging on the cakes below. Now the fun part, what ever the theme, go to a hobby store or toy store or where ever you can find little figurines or other objects that carry your theme and purchase them. Be carefull here though, you can spend a lot on those if you don't watch your Ps and Qs. And of course, you can use things you may already have. Just be sure they aren't so heavy they'll fall through the cake. If you do have something that's a little heavier than you think the cake can handle, try using a small cake board round or square to place on the cake and then attach the object to that and decorate around it to hide it. 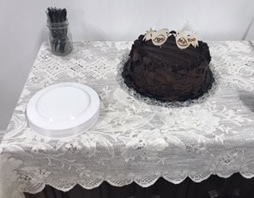 *A chocolate cake with chocolate curls bought at Costco with paper bird toppers...The birds are paper cutouts with the words "I Do" and "Me Too" written on them fastened to a toothpick. Everyone thought they were adorable and because it was a casual backyard rustic wedding they fit right into the decor. 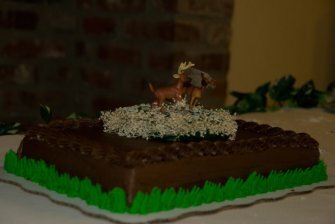 *A chocolate sheet cake purchased from a local supermarket with two deer as the topper...The female has a small tulle veil attached. Very cute for the huntsman groom. 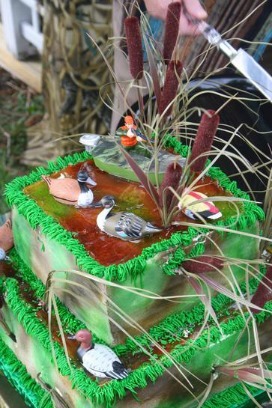 Here's an example of a do it yourself video on youtube.com for making a possible groom's cake. I'm sure there are some that are even easier, but this should give you an idea of what's able to be made. This is an area that you will be glad you didn't spend a lot of money. 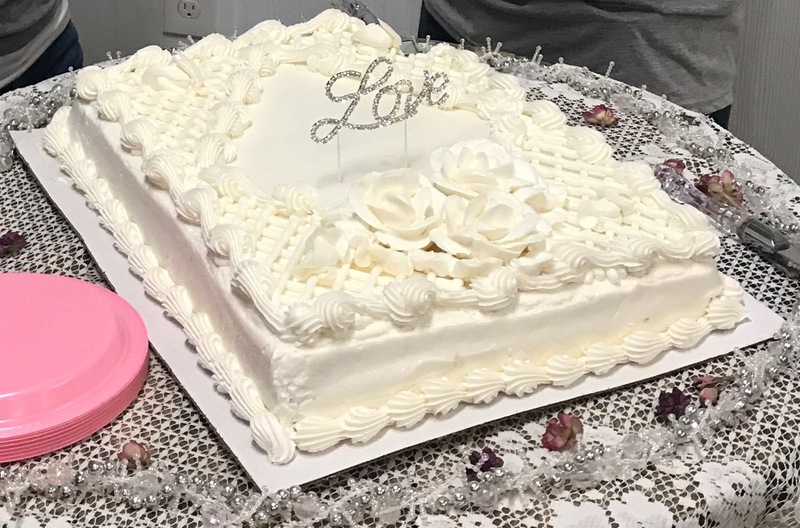 The pictures and memory of cutting the cake are an important part of the reception to most, but it is so short lived that having a nice cake is much more frugal than having an elaborate and expensive one.